O, Canada: land of my fathers, land of David Cronenberg. I've encountered the master of body horror before, and I figured why not face him again? I loved Videodrome, as well as The Fly and Scanners, so any excuse to better familiarize myself with the director's filmography under the auspices of something vaguely resembling a work assignment was a welcome opportunity. Enter The Brood. Oliver Reed plays Dr. Hal Raglan, a psychiatrist pursuing an unorthodox technique called "psychoplasmics". Basically, he induces his patients to manifest their neuroses, anxieties, rage, fear, and all negative feelings into physical form as therapy. One man develops welts all over his body, another contracts lymphatic cancer, but most horrifying of all, his patient Nola (Samantha Eggar, the girl from The Collector) spawns a brood of deformed monstrous children that take out her anger at her abusive parents and menace her husband and five-year-old daughter. 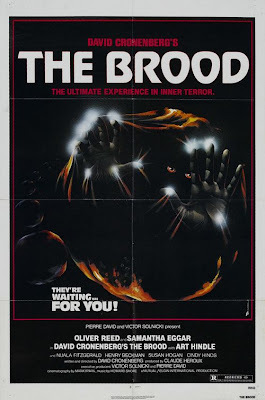 As is Cronenberg's M.O., The Brood's horror comes from the strangeness of one's own body, and Dr. Raglan's psychoplasmatics are a scary thing indeed. While Nola's true condition isn't revealed until the third act, its final reveal and what comes of it is disgusting. But was it scary? The eponymous brood does some jump scares but sometimes they come off less as scary, sickening monsters than as the Murderous Moppets from The Venture Bros. Nola birthing one and licking it clean, though? Scary as the day is long.